Let's look at the bright side of winter and snow, like all the great outdoor activities you don't get to do the rest of the year! 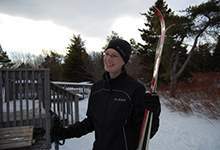 To check if the Winter Activity Centre at Pippy Park, or snowshoe rentals at Bowring Park are open, and to learn the trail conditions, call the Snow Line at 737-3651. To learn of rental costs check our website. And don't forget The Loop line is 733-LOOP (5667).